So after I got old Silversides up and running the way I wanted, with new tires, radio (pulled from another Toyota I had laying in the weeds), replaced the cracked windshield and did some other small repairs, I proceeded to drive the heck out of that truck. Over the next eight or nine years I racked up nintey eight thousand miles on her. Not without some troubles, by any means but what do you expect for a hundred bucks? The previous owner had run it too long with a leaking head and at some point the engine oil must have gotten thin because I could hear the connecting rods hammering between upshifts. I scouted around for another donor truck so I would have a spare engine ready to go should the day ever come, and lo and behold, my son found one by Mazeppa that his girlfriends’ dad had sitting. This one was an ’85 version cube van with a one ton chassis but the engine was the same as my ’86. We pulled that non-running ’85 home behind my Chevy, with some trouble on the way, but that’s another blog story all by itself. I got busy one fall pulling the engine out and set out to rebuild it that winter. By the time spring rolled around, I had the engine all reworked and old Silversides had over three hundred thousand miles on her. She still ran just fine but the rod noise was getting worse all the time and I was careful not to overrev the engine because of that. We even drove it to Mid Ohio one summer before I pulled the engine. Made the trip with no problems other than a front tire that developed a tread separation on the interstate just outside of Indianapolis that delayed us for an overnite waiting for a tire shop to open in the morning. Gas mileage was still good too, about 28mpg on the highway at a steady 70 plus. Going any faster than that would start the rod knocking noise and force you to throttle back just a tad. By the time I got around to pulling the old engine out there was three hundred five thousand showing on the clock. Not bad for a first engine. I had no idea if the transmission was ever rebuilt or replaced but I highly doubt that it was. With her new engine installed and all tuned up, old silversides perked right up and became my main transportation in the winters, transporting me to no less than three different places of employment over the years. In the summer, she just sat around for weeks at a time while I rode the motorcycle to work. I guess the beginning of the end came when the cross members under the aluminum clad box rusted out and I had to wedge a piece of lumber in there to keep heavy loads from falling through the truck bed. Then one summer I found a well-used Subaru Legacy wagon that was four-wheel drive and so I proceeded to fix that up for my winter work beater. It was the first four by four vehicle that I had ever owned. After that first season of driving the mighty Subaru in all types of winter weather, I was sold on Subarus. Not only was it virtually unstopable in the snow and slush but I found it super easy to work on as well. Old silversides got parked under the pine trees and would sit for six years until I aquired my “new” Toyota project, an ’89 extended cab two-wheel drive model that my son had previously owned and then sold to a buddy of his a few years back. Since it was originally from Arizona, my “new” truck is relatively rust free, especially the box and frame areas. Fairly important if you need to haul anything heavy. One big problem the new truck had was that the head gasket was bad, meaning coolant was getting into the oil and also leaking out causing the engine to overheat. Since old Silversides had a rebuilt engine with “only” sixty thou or so on it, the logical thing to do would be to do an engine swap. So about a month ago now I pulled old Silversides out of the weeds and up to the shop for her last operation. Boy, was she ever rusty, everywhere! Time has not been good to her. So after pulling the engine out and checking it over, then pulling the engine out of my new truck, I started the changeover. Intake and exhaust manifolds had to be changed as well as various sensors and the fuel injectors. Seems that Toyota made a few changes from ’86 to ’89. While the basic 2.4 liter engine block was essentially unchanged, virtually everthing else was. After the old engine was transplanted into my new truck and everything hooked up, it was startup time! After a few cranks of the starter she roared to life. Sounding every bit as good as old Silversides did when I parked her, I took a peek under the hood at the running engine only to see a spray of gas coming from one of the injector areas. Bummer! After shutting it down and some further inspection, I determined that the leak was indeed coming from number four injector. The intake and fuel rail would have to come off, again. After that was accomplished the offending injector was inspected and found to have a sealing o-ring with a slice in it. Not sure how that happened but it did. After replacing it and reassembling the intake, again, the engine fired right up and purred like a kitten, this time with no leakage of gas anywhere, whew. The new truck needed some other fine tuning as well. The rear brake lines had rusted through and that little episode took a trip to Napa and a day to remedy. The clutch slave needed to be bled of air and adjusted. Old Silversides donated her clutch cylinder as well as her rear tires and rims, which were fairly new when she got parked. There were just a few other nagging issues with the new truck, a side window that needed a new hinge pin, front and rear bumpers that were sagging and the front grill that had been pushed upwards in a minor fender bender at some point. After those issues were dealt with, it was road test time! This new ’89 is probably the nicest Toyota I have owned so far in over twenty five years and six trucks. Smooth running and quiet inside. 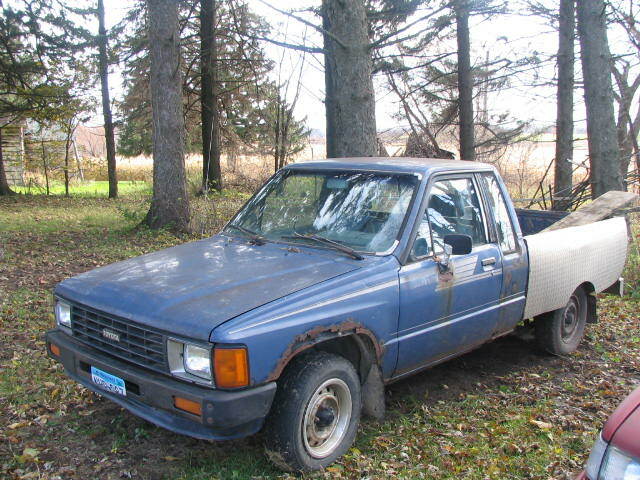 The thing should be an excellent work truck for years to come or until rust prompts me to park it in the weeds. Old Silversides will be off to the crusher sometime in the near future. Not excactly a fitting end for the old girl but at least parts of her will live on. Sometimes ya gotta let things go, otherwise the place would end up looking like a salvage yard, and that just won’t do.